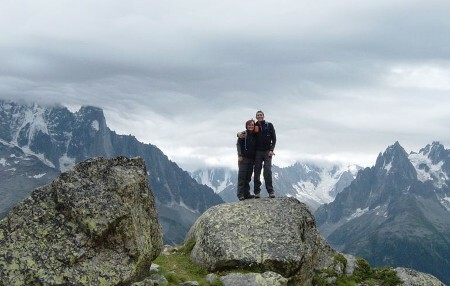 Our first hiking trip out of the UK, not really knowing what to expect we booked a package with Crystal Active, 7 days in Chamonix staying at Les Aiglons Hotel. 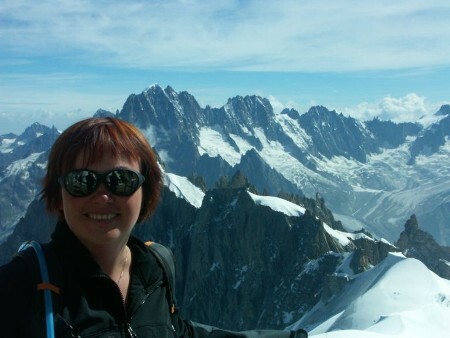 The Hotel was superb, just under the Aiguille du Midi cable car with views from the balcony across the glacier to the Mont Blanc massif. At first we were a bit sceptical about getting a lift pass, but by the end of the week not only had we got our moneys worth but we realised how accessible it made places, walking up hill and then getting the lift back or going from one cable car station to another. First day and to get a feel of the area and also suss out how the cable car system works we took advantage of a guided walk organised by Crystal, a high level but flat route starting at the Index cable car rising gradually to Lac Blanc before descending back to the Flegere Cable Car. The idea of taking a cable car up hill and walking down isn't our idea of fun, walking up and cable car down seems more appropriate but thankfully this route had a good mix of rocky terrain and scrambles to excite. Normally we tend to be out trekking alone only occasionally meeting others at summits or along the route so it was a new experience to be joined by 20+ others but soon the group split as we all found our own pace and it was quite nice to be able to chat with others as we went along. Everything was going smoothly until the final ascent and the altitude hit, for a short time it was like walking through treacle. Certainly understand now why mountaineers have to get used to the altitude and acclimatise! Something we would find out for ourselves a few days later when we took the cable car up to Aiguille du Midi and struggled to walk up the metal staircase! Thankfully the views from this high vantage point were awesome. 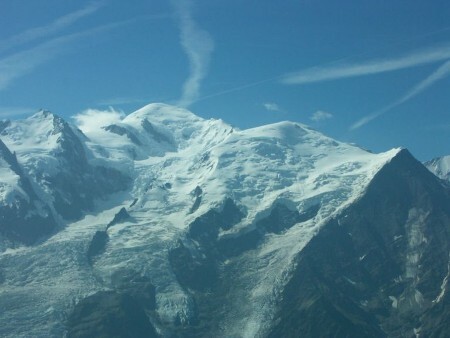 Mont Blanc rising out of deep glacial valleys. 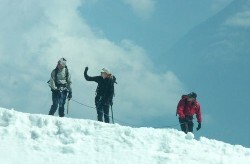 We were so envious of the 'Alpinistes' roping up and heading off onto the snow. 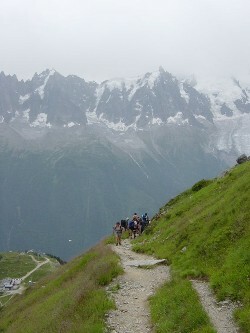 Our second day's walking took us onto the Mont Blanc massif range. Taking the Montevers railway to the Mer du Glace, walking up over the Signal and then along the ridge to the lower cable station of Aiguille du Midi, again another reasonably level walk once the initial ascent was out of the way. We took some time out to do a spot of climbing, first on real rock, our guide Denis arranged by Crystal, met us at Gaillands, a few minutes walk from the hotel. He made it look relatively easy taking up and fixing the lead rope to a grade 4 climb. Liz never having managed a grade 3 indoors took her time but didn't give in and reached the top, then onto a grade 5 with near impossible starting point but we both climbed the route. 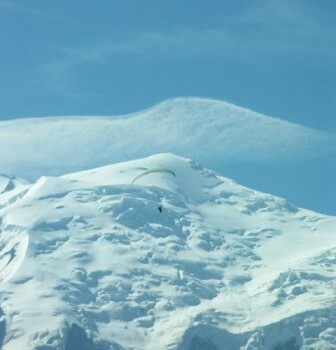 Great climbing in the sun, outside and with Mont Blanc behind. For a less taxing day we walked up to the Pranplatz cable car station and watched the parapenters throw themselves off the Brevent. 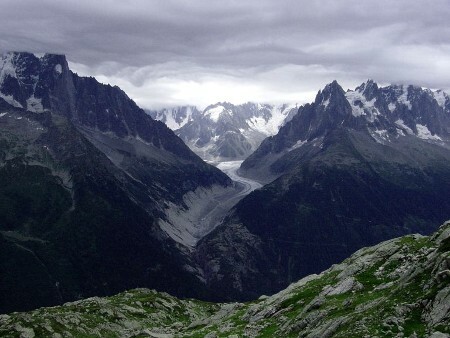 Final day saw our first full ascent of a 2500 m peak, Le Brevent. Lizzie had been looking at the peak all week determined to get to the top. Starting from Chamonix there are a number of choices, one ascending by the 'ski run' and the other through the forest. The ski run looked the easiest a wide zig-zag upwards but we took the forest trail eventually meeting the ski run below the lower cable car station. From here there is a bit of a tourist route to the summit or the more difficult option of taking a track around the front of the Aiguilles Rouges to Col du Brevent then across the back of the range to the summit. Needless to say by accident we went this way! Halfway up we came across a group of impaired walkers being taken out on contraptions that looked like stretchers on top of large wheels, how the helpers managed to get these up and down the tracks is beyond me, they were closely followed by a mule loaded with equipment. On one bend the mule above dislodged a rock that bounced on the path below then over the next bend almost hitting one of the people on the stretcher. Imagine you struggle all that way only to be brained by a falling rock! By now we were in proper mountain terrain and not sure we were doing the right thing or even going the right way. Luckily the way ahead looked more intimidating than it was and the route was clearly marked in red paint so we continued turned a corner and saw the ladders. Yipes, our first Via Ferrata and we weren't expecting it, Kev was so concerned about whether we were lost that he didn't take any pictures as we scrambled up, thankfully it wasn't too difficult and by the time we were on the second ladder it was quite enjoyable. We will have to go back again for the pictures! Summit eventually reached, just in time. High winds had closed the cable car and they were only taking people down off the summit, needless to say we took advantage and jumped into the car saving our celebration drink of Kir for the cafe at the midway Planpraz station then before our legs seized up crawled into the cable car for the final descent down to the valley below. So, that was our first experience of the Alps. Unbelievable scenery, great walks and hospitality. The mountains managed to show who is in control, a violent rock and ice fall occurred while we were having a break at Lac Bleu close to the Aiguilles du Midi. We could hear the cracks and tumbling rock but fortunately too far away to see it. Sadly several people were killed and badly hurt. That evening from our balcony we watched the rescue helicopters going back and forth, thankful for our own safety and aware that nature has a power to be respected.